The Gujarat Co-operative Milk Marketing Federation (GCMMF) has been bringing out one of India's most creative and compelling advertisement campaigns covering the entire spectrum of the country's business, politicians, sports and entertainment. 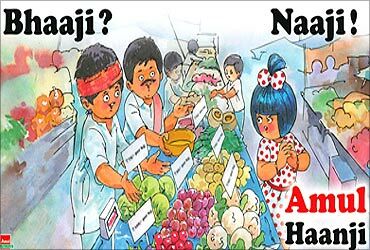 The Federation, which markets its products under the brand name Amul, has been running catchy advertisement campaigns since 1966. 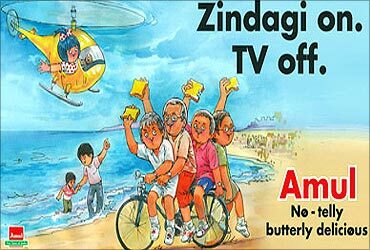 Amul's longest running advertisement campaign has also found a place in the Guinness Book of World Records. 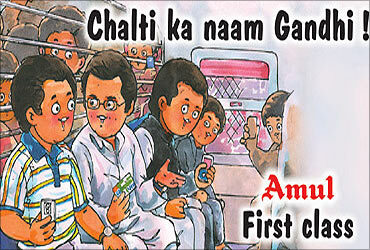 The 'Amul baby' in the ad is a chubby girl usually dressed in polka dotted dress. 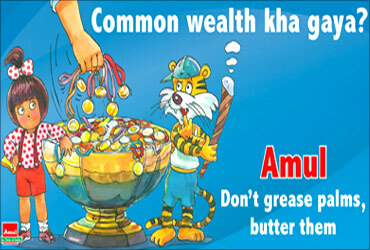 Sylvester daCunha designed the first ad campaign for Amul Butter. 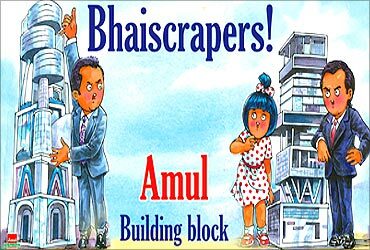 Thanks to Dacunha Associates, these punchy advertisements have been entertaining us since the last five decades. Image: Advt on 2G scam (Nov 2010). 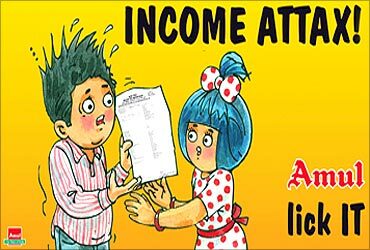 Amul advertisement on taxpayers receiving erroneous recovery notice from the income tax department due to an error in software (April 2010). An advertisment showing how brothers Anil and Mukesh Ambani are competing with one another building their huge private mansions in Mumbai (Dec 2010). This advertisement shows Finance Minister Pranab Mukherjee going to present the Budget (February 2011). 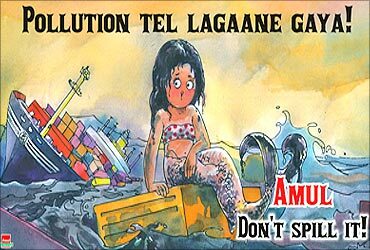 The advertisement shows the oil spill off Mumbai coast (August 2010). 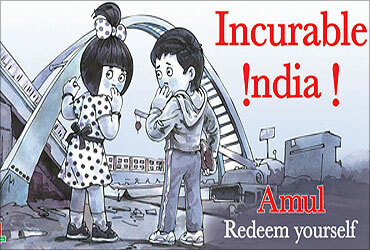 Image: An advt on pollution. The advertisement on unaffordable prices of onions (December 2010). Image: Advt on price rise. 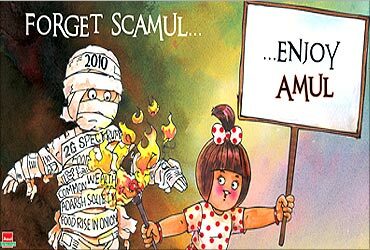 Amul advertisement bids farewell to 2010 the year full of scams (January 2011). An advertisement unaffordable price rise of vegetables (January 2011. A leading publication promoting 'No TV Day' in Mumbai (January 2011). Image: No TV Day advt. An advertisement on the growing popularity of Facebook. Achutanandan had recently hit back at Rahul who had referred to the 87-year-old CPI-M stalwart's advancing age during a poll campaign, saying he had come to Kerala to campaign for 'Amul babies', as the Congress leader himself was an 'Amul baby'. Quick to capitalise on the chief minister's diatribe, GCMMF has come out with the ad conceptualised by DaCunha Associates, a Mumbai-based ad agency associated with the co-operative since 1966. Image: Advt on Rahul Gandhi. An advertisment highlighting the Rs 4,000 crore scam at Jharkhand for awarding mining contracts and leases (Nov 2009). Image: Advertisment on the scam. 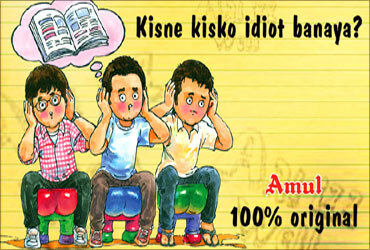 An advertisement on the copyright controversy surrounding Bollywood film- 'Three Idiots' ( January 2010). Image: Advertisement based on Bollywood film. An advertisement that shows the controversy over BT Brinjal. 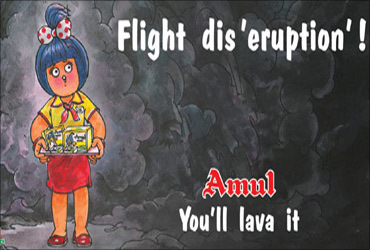 Image: Amul ads reflects current news. An advertisement on Bollywood blockbuster 'My name is Khan' (February 2010). 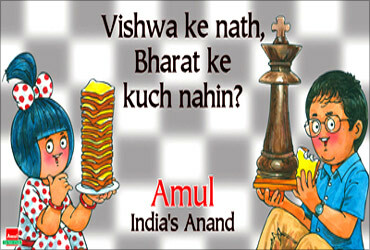 Image: My name is Khan as Amul advt. An advertisement on the controversial IPL team from Kochi. Image: Advt on IPL team from Kochi. An advertisement on volcanic ash from Iceland leads to closure of European airspace disrupting flights worldwide (April 2010). Image: Advt on volcanic ash from Iceland. 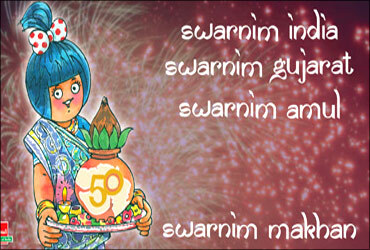 An advertisment celebrating 50 years of Gujarat. 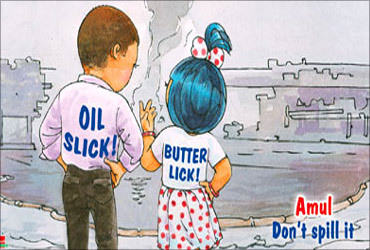 Amul advertisement based on a popular male deodorant advertisement (May 2010). Image: Advertisement based on TV ad. 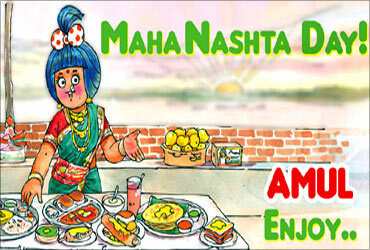 An advertisement celebrates Maharashtra Day (May 2010). An advertisement on the oil spill in the Gulf of Mexico (June 2010). Image: Advt based oil spill. An advertisement on the rampant spread of malaria in Mumbai (August 2010). An advertisement on the controversy surrounding the Organising Committee, of the forth-comming Commonwealth Games (August 2010). Image: Advt to be Commonwealth Games. An advertisement on the controversy on World Chess Champion Viswanathan Anand's citizenship (August 2010. One topic is released nationally every week, while another is specific to the region of news-focus. The sorry state of affairs in organising the forth coming Commonwealth Games (Sept 2010). Image: Advt shows Commonwealth Games. 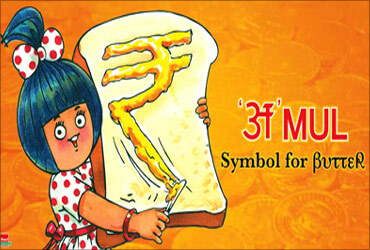 An advertisement shows the Indian rupee symbol. 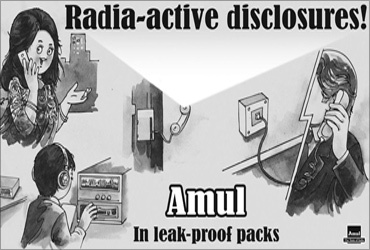 Niira Radia's phone conversations also became the theme for one of the Amul advertisements. 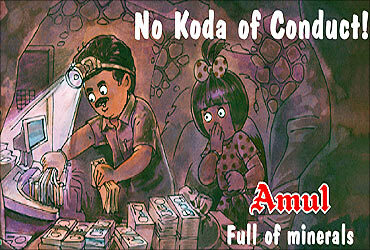 Image: Niira Radia on Amul ads. 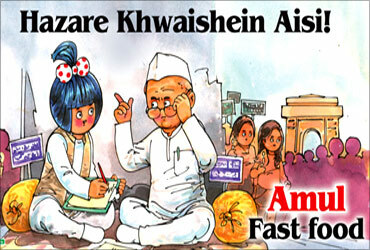 Anna Hazare's fasting is highlighted in one of the recent Amul advertisements. 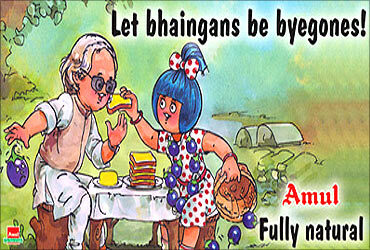 Image: Anna Hazare in Amul ad. An advertisement after Ambani brothers decided to settle their differences and remain cordial. 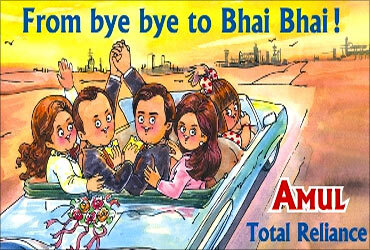 Image: Advt on Ambani brothers. Bengal vs Tamil Nadu: Which state ranks better?